This meal is the ideal evening meal as it is low carb and it is very feeling. You will not for sure be hungry after eating this dish. If you want to throw in some carbs you can add 1/2 cup of cooked pasta to give even more volume to it. I personally like like that. You can make the meat for a few days and keep in the fridge for max 3 days and freeze the rest. Cook your zucchini fresh and you have a super quick healthy meal! To make the meat start by sautéing the onion, carrot and celery for a few minutes. Add then the meat until brown cooked. Pour the tomato sauce and season with sea salt, pepper and your fresh parsley. To spirilize the zucchini I use a spirilizer from a brand called GEFU which I bought on Amazon is the small version and it is very handy. If you don’t have one you can cut the zucchini in small and thin long sticks. Spirilize your zucchini and sauté it in the pan for only 2 minutes season with pepper and chilli flakes. You don’t need to cook more the zucchini for more than 2 minutes as it turns very watery very quickly. 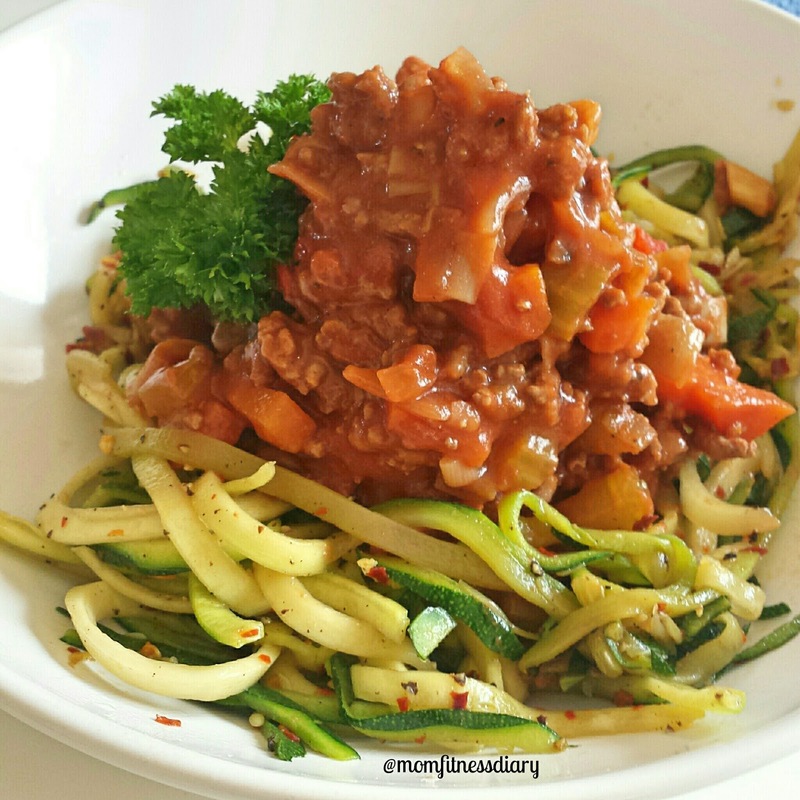 Plate your zucchini and top it up with bolognese sauce! If you are maintaining add up a bit of parmesan or cheddar on top. If you are losing I would recommend leaving the cheese out. So great! I love it.